Shhh…. don’t tell anyone I’m breaking my self-imposed blog break! 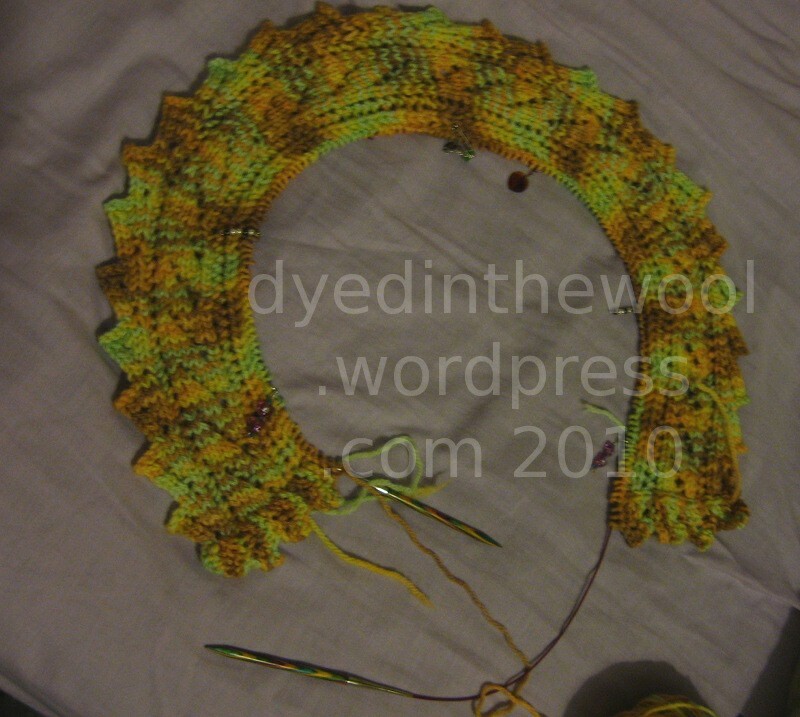 This post contains the entirety of my Christmas 2014 knitting. All of it. First up is the Cobblestone Pullover (pattern by Jared Flood/brooklyn tweed) originally published in the Fall 2007 issue of Interweave Knits. My original plan was to do the whole thing in 4 tonal colours but I realised that with the short rows in the yoke this wouldn’t work. I switched to make the whole thing in Hayfield Bonus Aran Tweed. I only had one 400g ball so I purchased a second, with a completely different dye lot. The “double teapot” or “sugar bowl” pose! 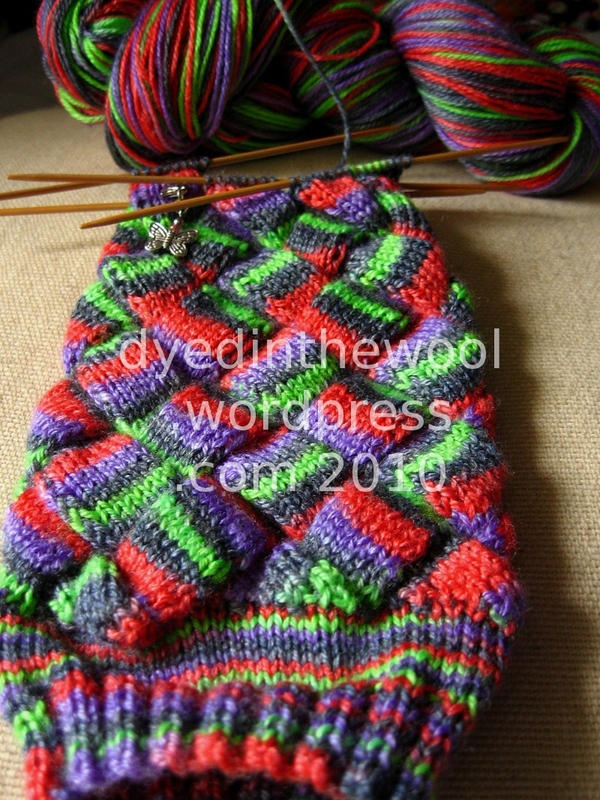 Luckily, I’d already done a temporary cast on for the yoke and knit UP. So I made the sleeves (minus the cuffs) in the same dyelot as the yoke and used the second ball to knit the body and the cuffs. My dad requested ribbed welts, for functionality, but I carried the garter stitch panels on the body down to the cast off. Note the garter panel at the side. 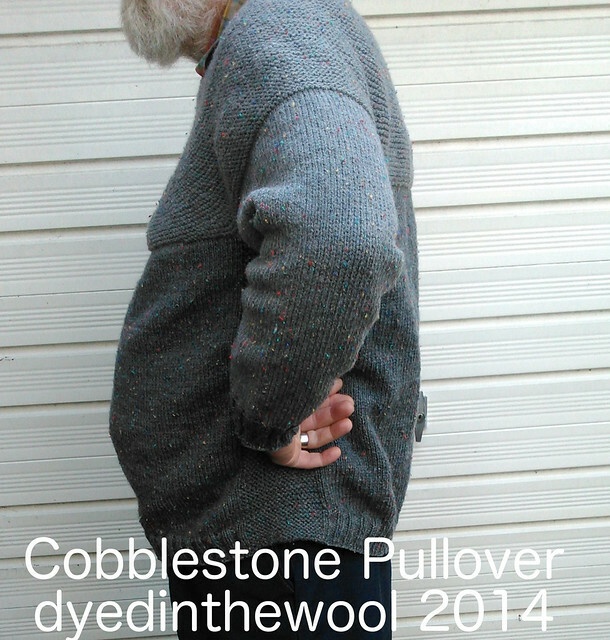 The slight pull actual works well and means he can get into his trouser pockets a bit easier! 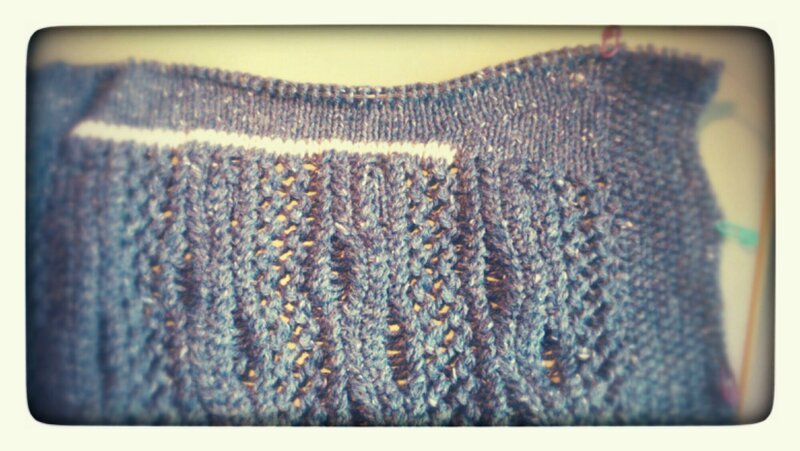 I did some short rows at the back hem to compensate for my dad’s slight stoop. When I’d finished the jumper I had 80 g of yarn left over so on Christmas day I made a “matching” hat. 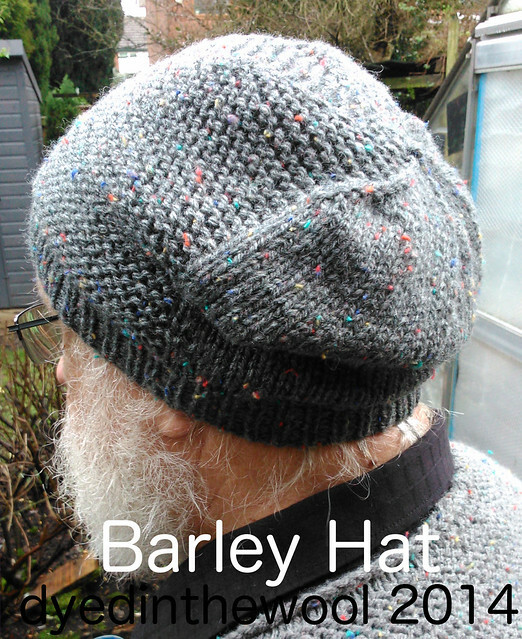 Barley hat to “match” the Cobblestone Pullover. 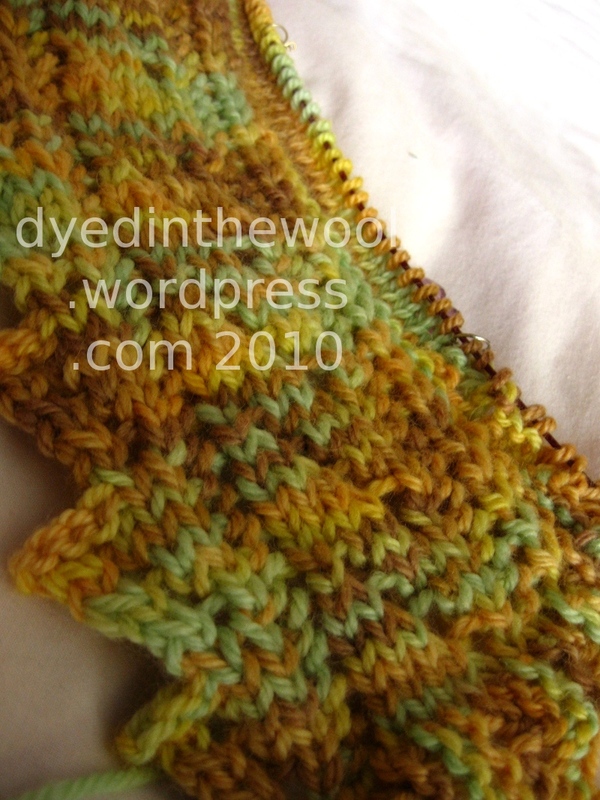 I chose this because of the garter stitch panel. I was slightly concerned that the slouchy style wouldn’t look great, but I think it really suits him! I’ve been on something of a ’90’s music jag lately, re-listening to Alanis et al, but one song that’s stuck in my head is this beautiful number from Tuesday Night Music Club by Sheryl Crow. 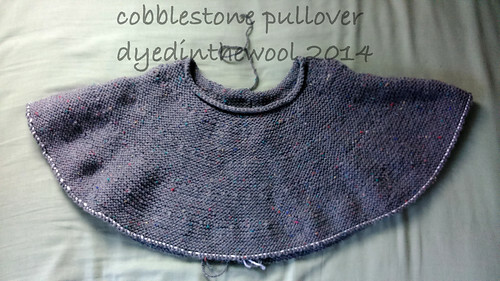 But I’ve also made progress on the Cobblestone Pullover. Although I will admit it does resemble a rah-rah skirt in this photo! 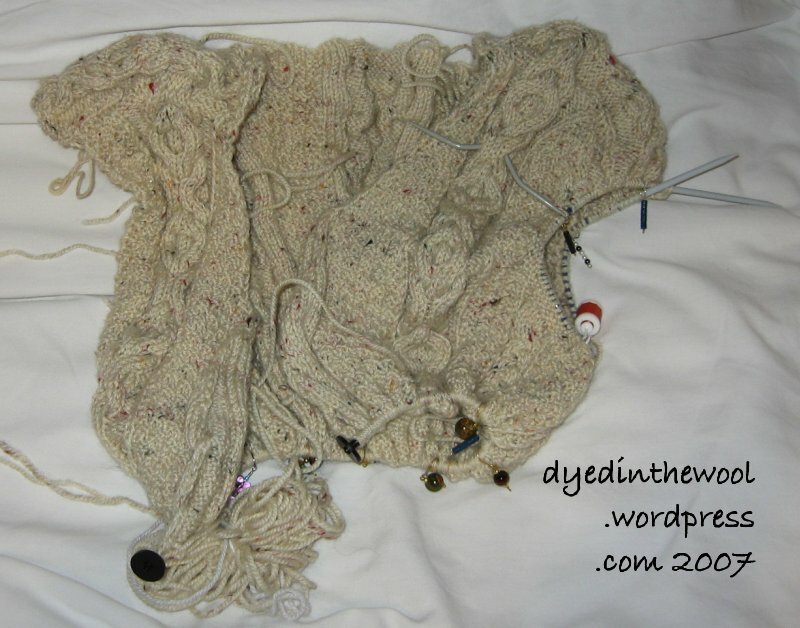 The line of white along the bottom edge is the waste yarn I used for the temporary cast on (I knit up from this to the collar). I was originally going to do 4-colour stripes (just to use up the yarn I had) but I couldn’t think of an elegant way to achieve this. 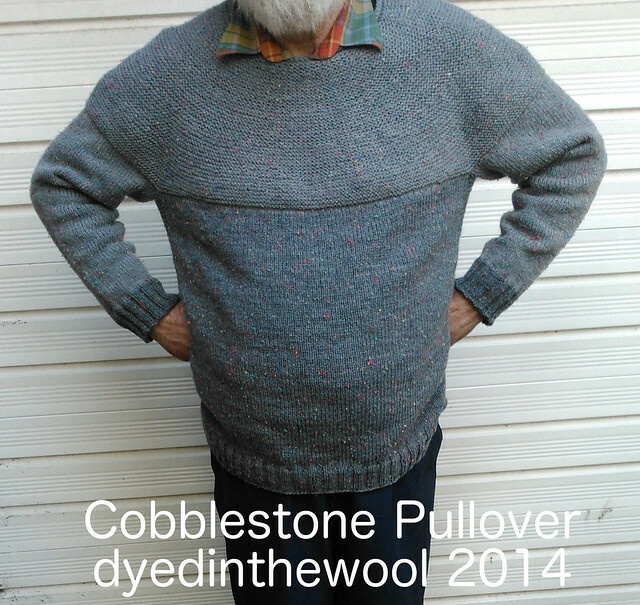 Luckily, the main yarn is still available so I’m going to order another GIANT ball and make this an all-tweed number. Such is the life of a chronic! 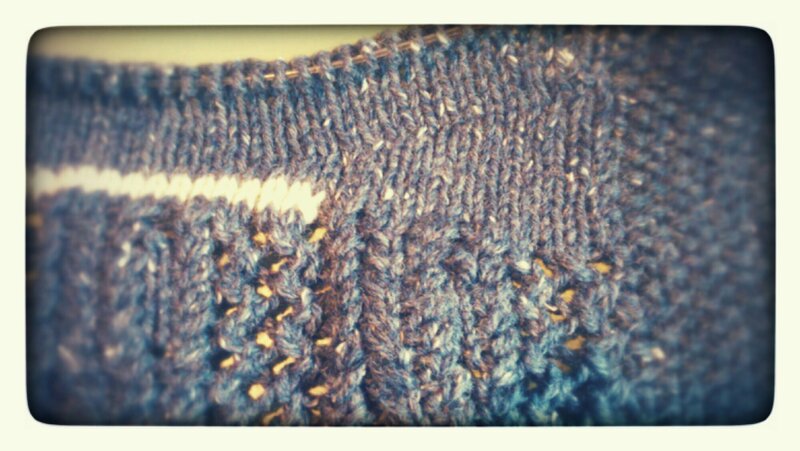 I’ve been quietly knitting away on some things and attempting to sew some more things. I’ve been hanging around online, and generally making a nuisance of myself. I’ve joined my first ever book group! Right, photos or it didn’t happen! No, it really is that colour! Hate the yarn, love the recipient. So as an incentive I bought some lovely Aran-weight yarn from an independent dyer based just over the border from me in Yorkshire. 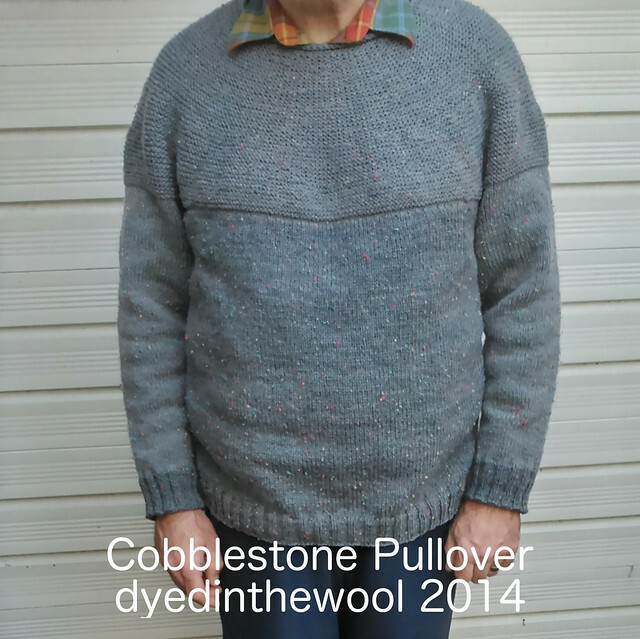 I was looking for some yarn for my Watershed cropped vest and found Wharfdale Woolworks on Folksy. Rubbish photos, but I think you get the idea! I’ve made an accidental modification to Watershed which I’ll talk about in the FO post but, as Tim Gunn would say, I’m making it work! No promises as to next post schedule but let’s just say I hope it will be sooner rather than later?! One of the things that knitting has taught me is the art of patience. Knitting something like my dad’s aran jacket requires this skill in vast amounts. 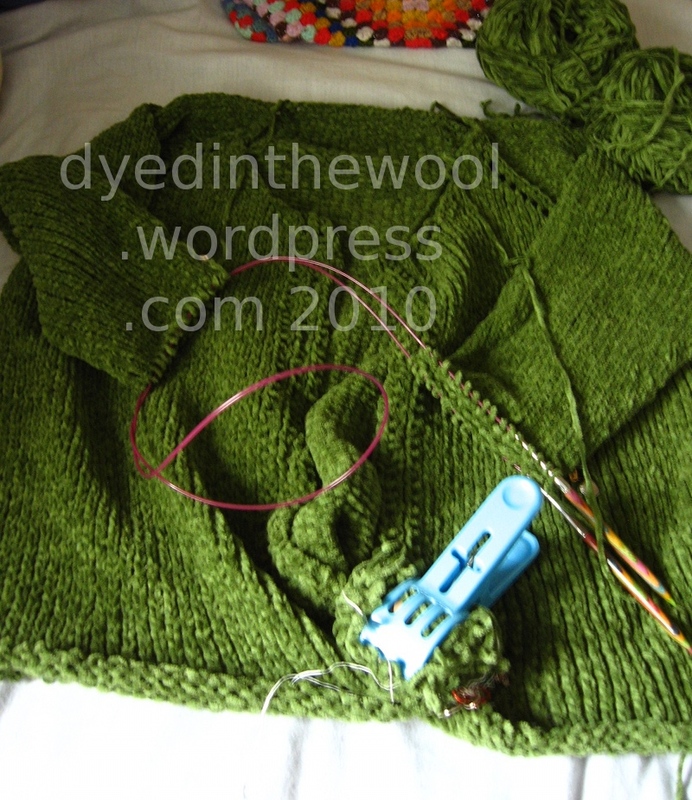 In order that I don’t get bored of the project too quickly (or never) I’ve switched from knitting the main body of the jacket to the sleeves (you can see the start of it in this photograph). I’m fairly certain that I’m not going to make it by Christmas, but that’s OK with me and there is a back up present ready. I also learnt the art of patience last week when, on Monday, my maternal grandfather was admitted to hospital following a routine blood transfusion for his leukaemia. Unfortunately, he died on Friday. This came in the same week as the anniversary of my paternal grandfather’s death in 2003. These events have been stressful for a number of reasons, not least of which is the fact that I couldn’t, and can’t, be with my grandmother. She’s not the easiest of people to be with anyway, but my physical limitations are frustrating. I hadn’t seen my grandfather in over two years (for various reasons) and we weren’t terribly close, either emotionally or geographically, but obviously I am grieving. At the moment I’m focusing on helping my mum in anyway I can, but still being aware of not smothering her (something I’m struggling with because we are a close family). Unfortunately, my parents are also unable to travel at the moment and it’s all generally not good. 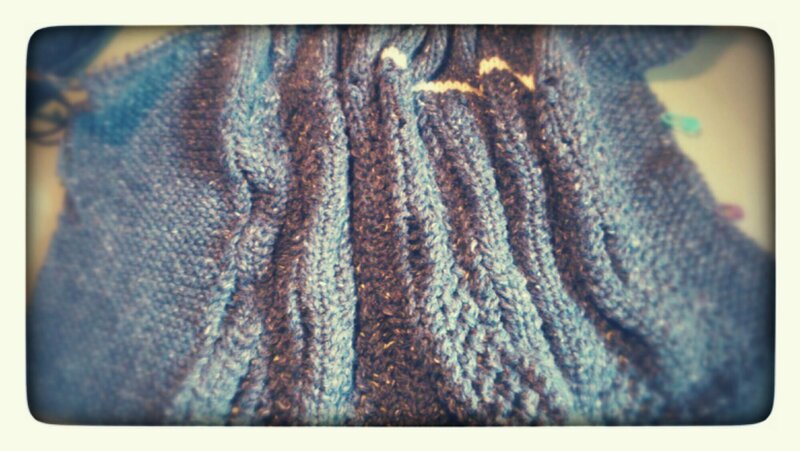 I’m sure we’ll muddle through (we have before) and I’ll keep knitting!